OtsAV DJ is a powerful playout mixing system for DJs (Mobile / Club / Video / Karaoke) and AV Enthusiasts / Hobbyists. It allows you to DJ with ease and experience professional quality audio with optional video/karaoke. Two editions are available - Silver (Audio Only) and Pro (Audio/Video/Karaoke). Featuring automated beat-mixing, intelligent fade-mixing, and a broadcast quality Dynamics Processor, you will benefit from a high quality sound. A powerful playout mixing system for DJs and AV Enthusiasts / Hobbyists. Mix and beat mix video content at broadcast quality, and present karaoke CD+G content. Present your music videos in a "MTV-style" with smooth titling, mixing and a scrolling ticker! OtsAV DJ features amazing time-scaling quality with a range of +/-100% (right down to stationary and up to double-speed). 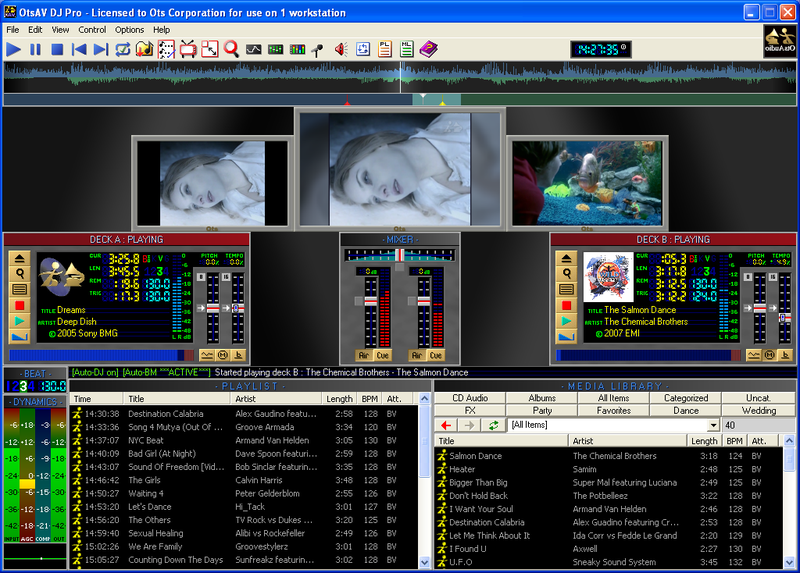 Many other features include volume management, manual override, powerful Media Library system, instant response controls, remote access control server, save as wave, cueing, tempo/pitch/direction deck controls, scratching, Enhanced Definition video output mode, CSV exporting, and much more. * MIDI Hardware Control - Compatible with all MIDI controllers providing hands-on tactile control. * High quality time-scaling / tempo deck sliders. OtsDJ is so perfect for DJs, radio stations and music lovers. The game speed adjuster can adjust game speed. An advanced Google file search client that finds files on online upload sites. Is a new word forming game. Dj tiesto Free Screensaver. Photos slideshow. Qweas is providing links to OtsAV DJ 1.85.076 as a courtesy, and makes no representations regarding OtsAV DJ or any other applications or any information related thereto. Any questions, complaints or claims regarding this application OtsAV DJ 1.85.076 must be directed to the appropriate software vendor. You may click the publisher link of OtsAV DJ on the top of this page to get more details about the vendor.